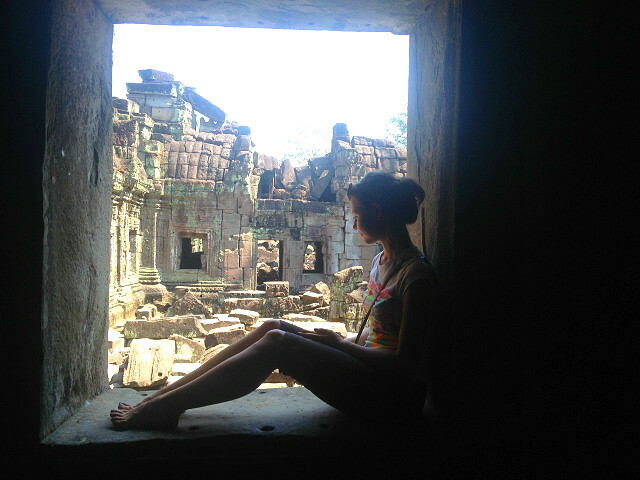 I had wanted to travel to the lost temples in the Cambodian jungle since I had first read about them in fifth grade. A place of mystery, one of the hidden places of the world, it fascinated me. King Suryavarman II, ruler of the Khmer empire in the 12th century, commissioned the building of the city and the temples dedicated to Vishnu, one of the three main Hindu deities. The Khmer empire stretched from China and Vietnam to the Bay of Bengal. 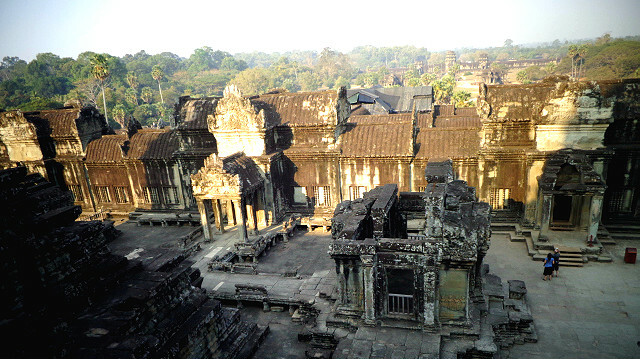 The king made Angkor Wat his capital and for the next few centuries the city and the empire thrived. But in 1431 the Thais invaded and destroyed the city. Abandoned, the jungle closed around it and Angkor Wat became a legend until the French mounted an expedition to it in 1860 and brought the beauty and wonder of the place back into the light. While living in Chiang Mai, Thailand I saw a great AirAsia promotion to fly around SE Asia. I took my chance and went on to Phnom Penh, the modern day capital of Cambodia and the site of riot and misery and bloodshed not too many years ago. I wanted to experience as much of the country as I could, so I managed to find a bus that would take me the two hundred miles from the capital to Siem Reap, the city closest to the temple ruins. The road was bumpy, poorly maintained and where it wasn’t muddy, it was dusty. We moved through the Cambodian countryside for nearly ten hours, sometimes walled in by jungle, other times looking out over river vistas or passing through small, shabby towns. We saw a few cars and trucks, but the main form of transportation seemed to be feet or bicycle. After passing miles of flooded rice paddies and dozens of half starved white oxen, I arrived in Siem Reap in the afternoon. I immediately hired a guide, Phan Dith, (who told me his name meant ‘wise man’) and a tuk tuk. We set out for the lost city. The tuk tuk, which is a cross between small car and a rickshaw, brought us to the entrance to the Angkor Archaeological Park in just a few minutes, where I bought a three day pass for $40 USD. The price for a one day ticket is $20 USD. We passed through the entrance and there was the temple of Angkor Wat, which is only one of the temples in this huge complex. We walked across the bridge over the moat and reached the outer walls, where I had to stop for a while to admire the bas-reliefs. There are hundreds of them, maybe thousands., each with a story behind it. It seemed that Phan Dith knew all the stories. But I hurried him along because I wanted to get to the temple of Phnom Bakeng to photograph the sunset. The path is nearly a mile long and mostly uphill and I was exhausted when we got there, but the view was spectacular and the sunset ethereal. Over the next two days, Pan Dith and I walked and rode around the ancient city. We started the next day with sunrise from the walls of Angkor Wat, along with a hundred or so other people. 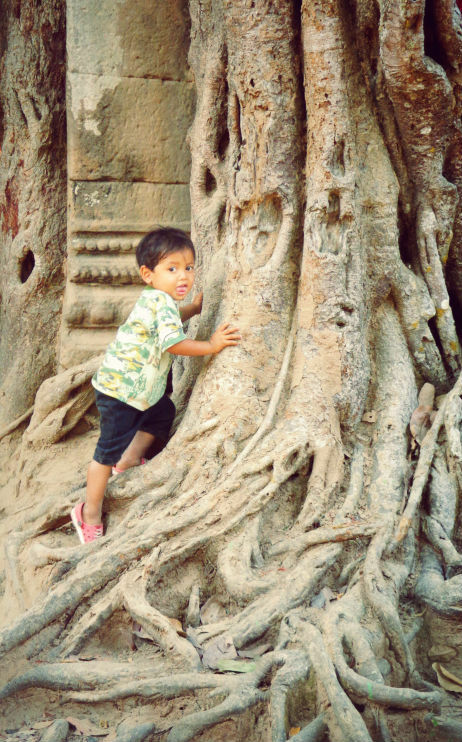 I wanted to see only a few specific sights, but especially Ta Prohm, the tree temple. 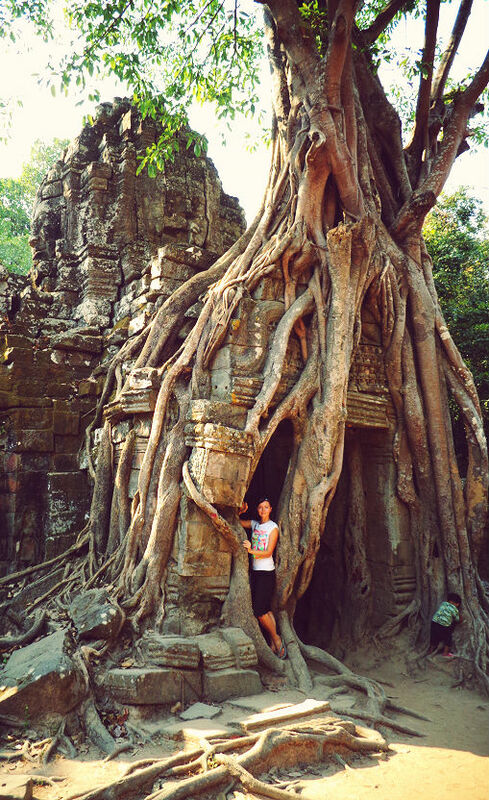 When the Europeans began to restore the temple complex, they left Ta Prohm alone, except to reinforce the walls. The trees had penetrated the walls of the temple grown over and around it. Trying to remove the trees would have destroyed the temple. The scene of the ancient walls overgrown by roots and branches is beyond exotic and has been used in movies. 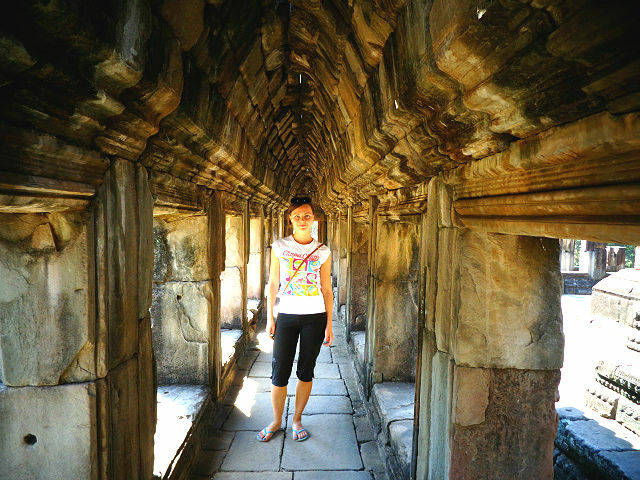 My final day I spent in the center of the royal city of Angkor Thom at the Bayon temple. 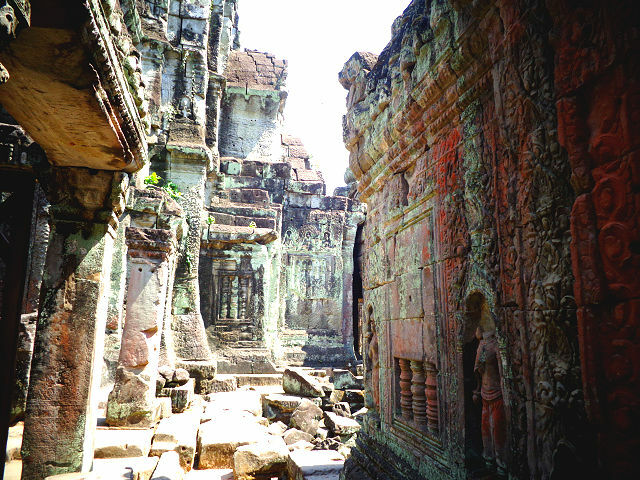 Built a century after Angkor Wat, it differs in some respects. It has not outer walls, since it is surrounded by the city. It is the temple of the big faces. Over a hundred huge faces are carved into the stone, each with full lips, curved in a slight smile. Everywhere you go in Bayon, the faces seem to be looking at you. That afternoon as I left the city and the park, I looked back at the magnificent architectural accomplishments of the Khmer empire and saw why it has been compared to lotus blossoms opening. Each temple rises to the sky like a closed blossom ready to open. 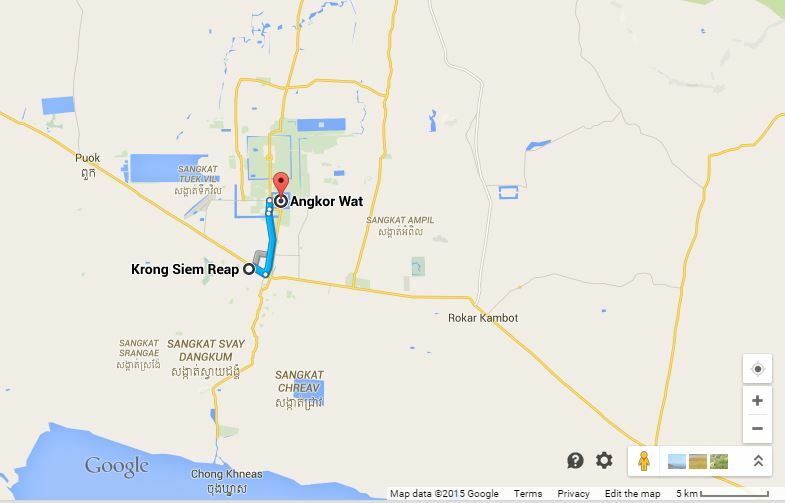 As I said above, Angkor Wat a huge complex of many temples, the closest city to it is Siem Reap, Cambodia. There are some hotels just in front of Angkor Wat, but in case you want to eat out, go shopping etc. 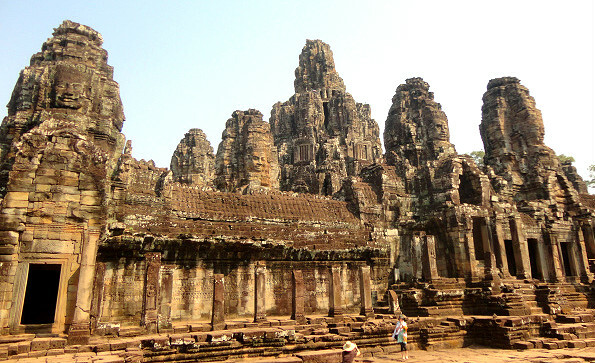 you will need to go to Siem Reap in anyway. It is located around 7 km away (10-15 minutes driving). There is an international airport in Siem Reap, so you can fly there, AirAsia being usually the cheapest option. 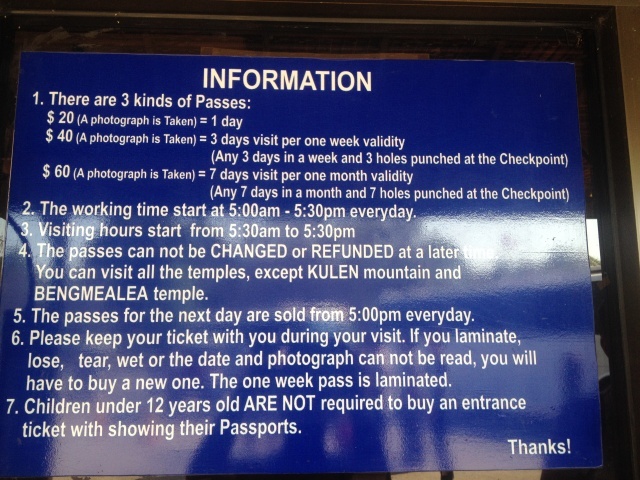 If you are going from Phnom Penh, I DO NOT recommend going by bus to Siem Reap! It is an exhausting 12 hours bumpy road. It doesn’t worth the money you save, believe me! I strongly recommend flying between the two cities. Here are the up-to-date rates, i specially took some pictures for you. As you can see, I bought mine for 3 days, which was in my opinion enough. Now, it might be not clear in the beginning (it least it was not for me) – as the distances between the temples are huge – you cannot walk from one to another. I mean, you can, if you really want, but it will take you half a day to get from one to another and you will be already exhausted. So, driving is the only option. Tuk-tuk – the most popular and convenient option. You should hire a tuk-tuk driver for a day (or more). I found my on Pub street, just asked a couple of them and chose the one who spoke the best English. If he can tell you a little about the history, that’s a big plus, usually they can’t. Normal driving rates are – 15$ for a small circuit and 18$ for a big one. Bicycle – yes, you can also drive a bicycle there! I have heard that it is very exhausting, so I skipped that. but I saw many people doing that. Motorbike is not an option! 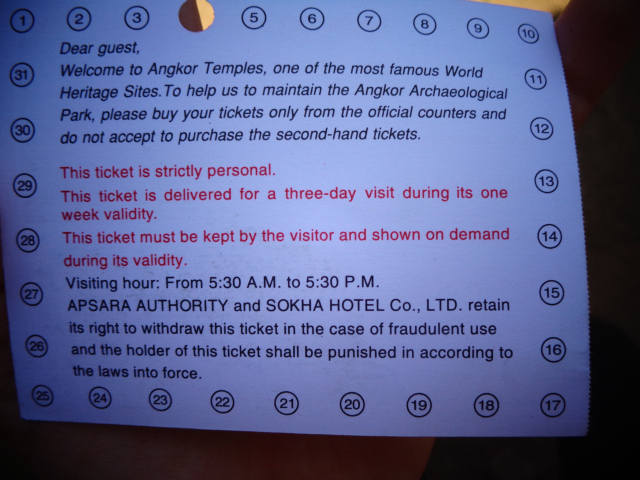 Unfortunately, using motorbikes by foreigners inside Angkor Wat complex is prohibited. For the following reason – foreigners don’t know how to drive and there are too many accidents because of that. Despite that, using the bike is allowed in the city of Seam Reap, where the traffic is way worse. Thus, in my opinion we are not allowed to drive there for a “mafia” reason – if you can drive there yourself, who will get the tuk-tuk drivers then? Thousands of men will be without job. So, I am just saying, scooter is not an option, you will have to pay a big fine. Hotel Somadevi Angkor Boutique and Resort will make you fall in love with it thanks to its design, cuisine and the fact that it is located in the heart of the city. Golden Temple Residence is located within walking distance from the city’s nightlife and reviews from the guests have mentioned the hospitality for the staff. Cambana Residence is designed in classical Cambodian style. It offers excellent services and is situated near the Angkor National Museum. 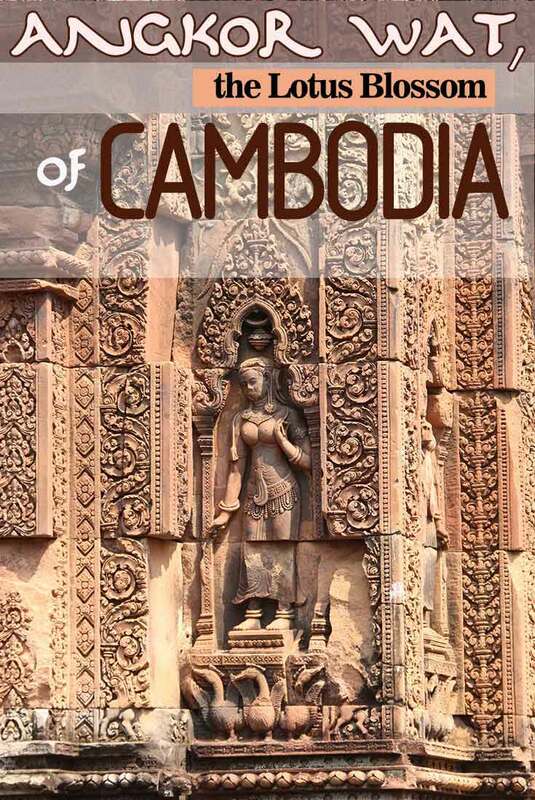 It should be visited by anyone who wants to try local cuisine and experience Cambodia up close. Asarita Ankgor Resort and Spa is renowned for the Spa and Massage therapy services they offer. Guest have had only nice words to say about this property and its staff. 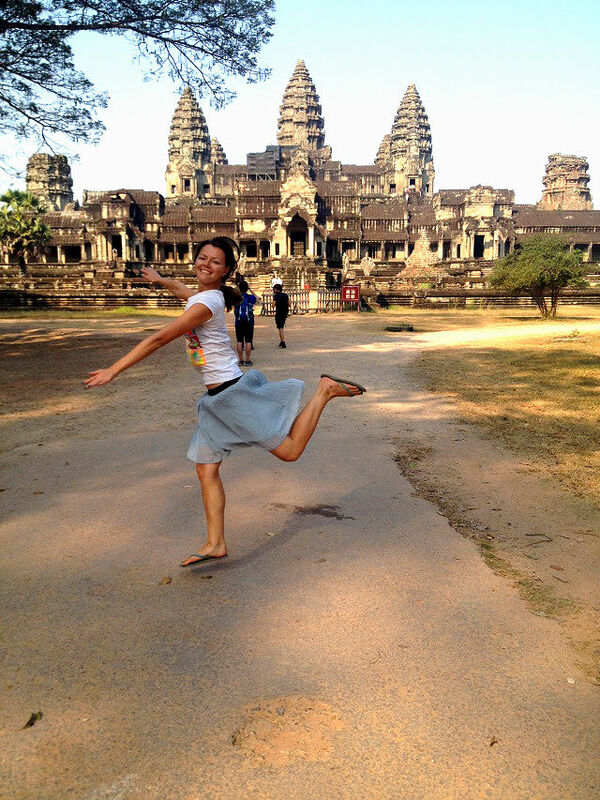 NEXT: For things to do in Siem Reap read this detailed post from my friend Claudia! I hope you enjoyed it and it will be useful for you when you go visit this amazing complex! 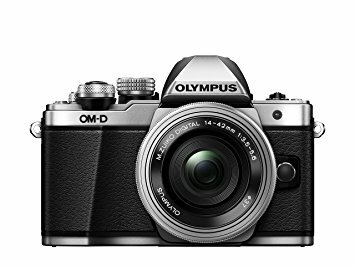 Support me – share/”Like” the post on your preferred social network! 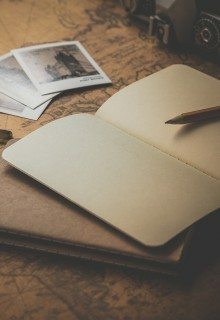 Your beauty and spirit of adventure is all that make every word of your blogs so enticing and amazing! A fifth grade passion taking its course and I can see the excitement in your eyes in these pics. This place is really a solace for one’s soul and the history says it so Yulia. 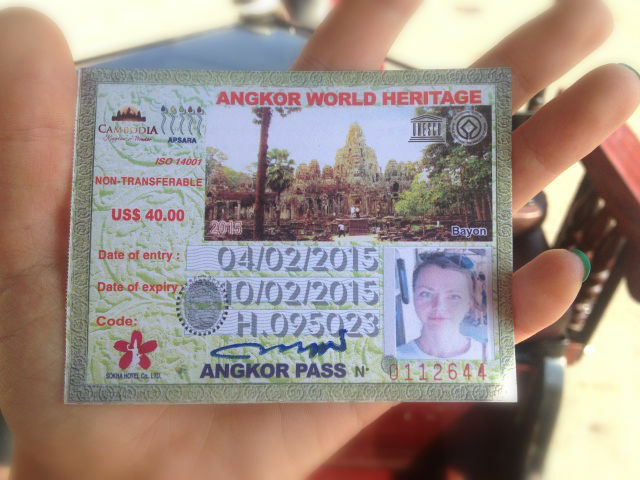 Hi Yulia, great post–we were at Angkor Wat the same time you were! We went to see the sunrise but alas, it was too cloudy. Lots of tour buses and crowds–better to go early.